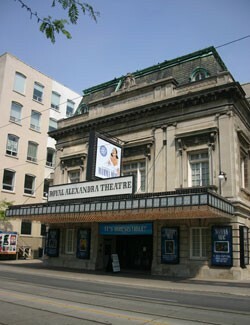 A masterpiece of beaux-arts architecture, the historic Royal Alexandra Theatre is Toronto's senior theatre. Built in 1907 and never having been converted to any other use, it is one of the oldest continuously operating legitimate theatres in North America. The Royal Alexandra embodies the ambition of the young Toronto stockbroker Cawthra Mulock, who sought to put his home town on the cultural map by building for it "the finest theatre on the continent." What he and his architect, John M. Lyle, created has since been called "an Edwardian jewel-box," a treasure chest of imported marble, hand-carved cherry and walnut, fine silks and velvets, crystal chandeliers and ornate, gilded plaster. The Royal Alexandra is also North America's only truly "royal" theatre - "royal" by patent from Edward VII - named with royal permission for his consort, Queen Alexandra, great-grandmother of the present queen. There are three levels of seating in the 1500-seat Royal Alexandra: orchestra, balcony and upper balcony (gallery). Each level offers a lobby, bar/refreshment area and washrooms. The largest lounge area, the Yale Simpson Room, is on the lowest level, beneath the auditorium. The Royal Alex has a wheelchair-accessible washroom on the street (orchestra) level, on the east side of the main lobby. The theatre was named a National Historic Monument in 1987, on its 80th birthday.